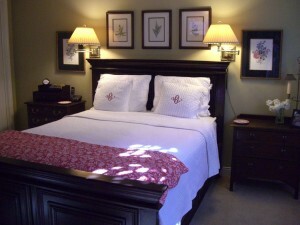 Tour of room #5, the bedrooms, of my “dream” house. Most of the images posted are rooms that I’ve admired and thought that IF we ever moved or built (which is highly unlikely) I would do this (fill in the blank with whatever great design idea I have observed). 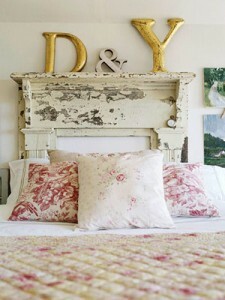 I like our bed and bed linens but I would like to change the paint color in this room. It is currently painted a Martha Stewart “Tea” and it’s a little more green than I would like. 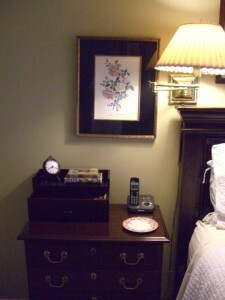 Close-up of left side of the bed. Close up of right side. (Note to self, hide the lamp cord better). This is the dresser/TV area of the room. As you can tell it’s a pretty small room, but we mostly just sleep here so it works. In our house the master bedroom is the first room off the entry. I have thought this an advantage most of the time…as a light sleeper I could hear our boys come in during their teen years and knew if they had honored their curfew or not! 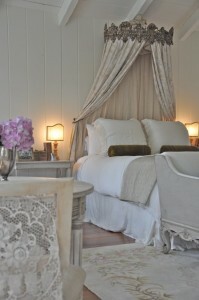 I like the size of this room and the mix of periwinkle and apple green are very pretty. 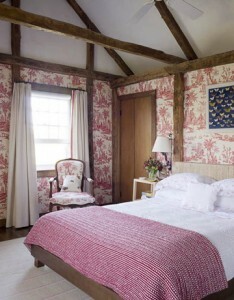 I love the beams in this room. 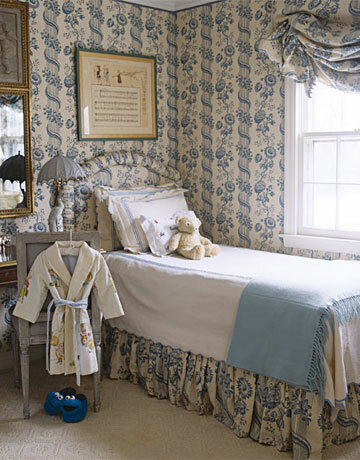 I also like the toile wallpaper but I know Hubby would draw the line there. One of our 3 bedrooms serves as an office and the remaining bedroom is our guest room. This is all I would need (space wise) in the study. Back to comfy beds that guarantee sleep, right? 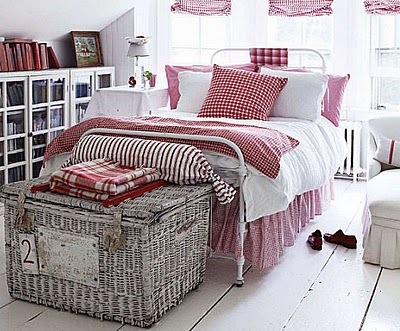 Love the painted floors and the old, chippy wicker hamper and the red and white. Very nice. 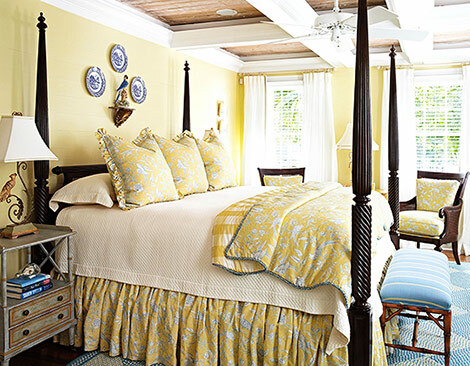 Sunny yellow paired with soothing blue, I feel relaxed already. I hope to one day make room in the office for a day bed so that little Olivia (grand daughter #1) will have her very own bed when she visits grandma and grandpa. 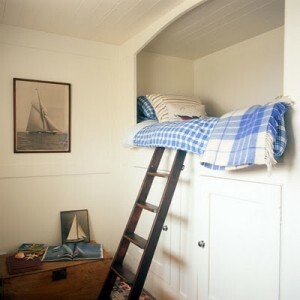 This (above) youngsters’ room is very clever. Space saving too! Maybe this would be doable on one wall of our study. 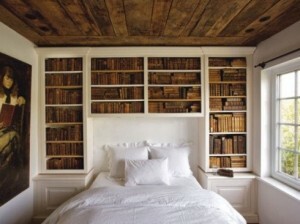 I love the ceiling in this room but more than that I love the bookcase. 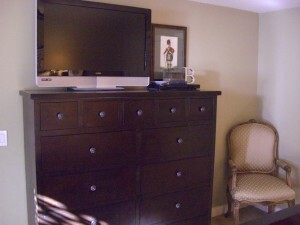 I could see swing arm lamps mounted inside the headboard area. 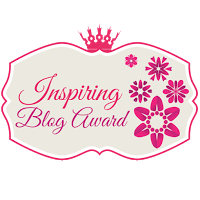 It’s a very cool idea, don’t you think? Wood paneled walls are always cozy but the push out windows above the bed seals the deal for me. 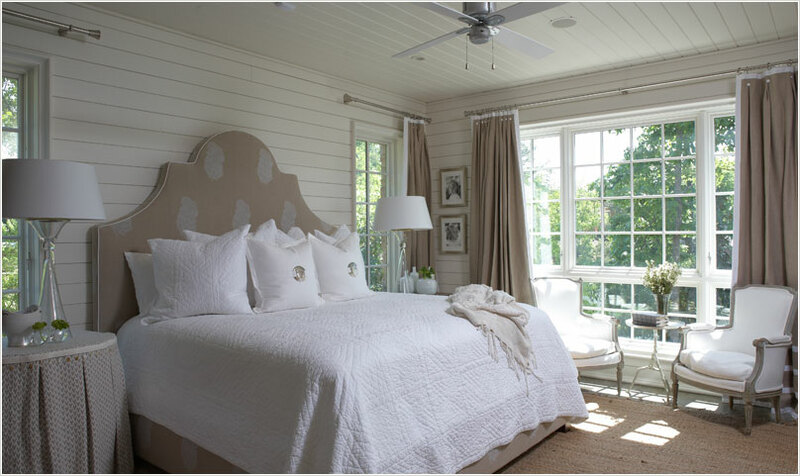 Such a sun-filled room would certainly give anyone a good reason to wake up with a smile on their faces. This is the beautiful, grown-up bedroom of the talented Brooke of Velvet and Linen. 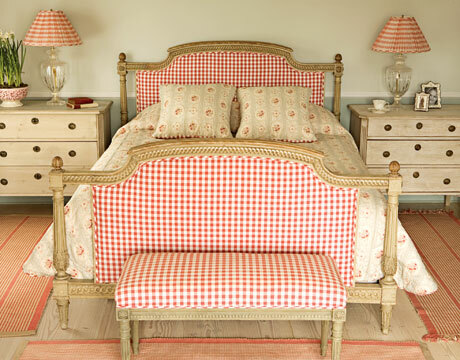 So very French! 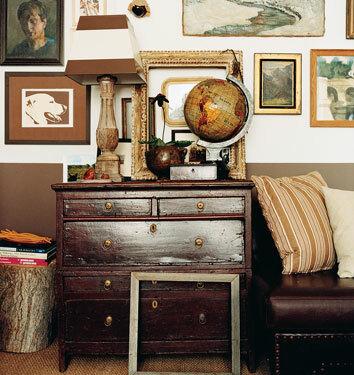 I really like the neutral palate and the wood walls. 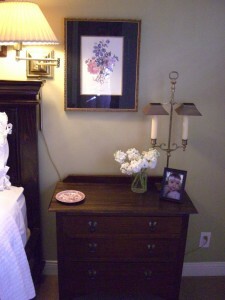 This would make a great teen room with the mantle for a headboard. Is your bedroom inviting and a place where you can get the rest you need? Pleasant dreams. I’ve read a lot of different theories on how to ensure yourself 8 hours of uninterrupted sleep. I’ve practiced reading before lights out, warm milk, a relaxing bath and mind calming exercise with some success. Overall, I have discovered that for me ‘order in my surrounding environment’ seems to be critical. 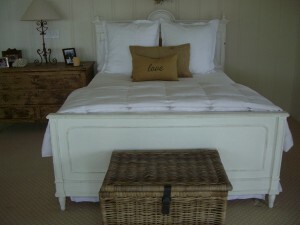 I know that must seem ridiculous to some but I can relax when everything is tidy, not so much when it’s not. What do you do to go to sleep and stay asleep? Excedrin PM anyone? I try to remember this quote, “Every twenty-four hours we are given a fresh canvas to prime, to make ready for the vision.” Sarah Ban Breathnach, A Day of Comfort and Joy. I always hope that I’m ready to face a new day with optimism and energy. 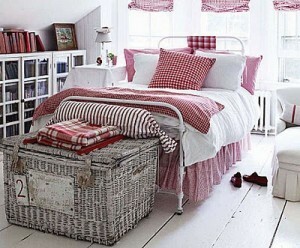 Below are some bedrooms that I believe could aid with this whole sleep and dream goal. 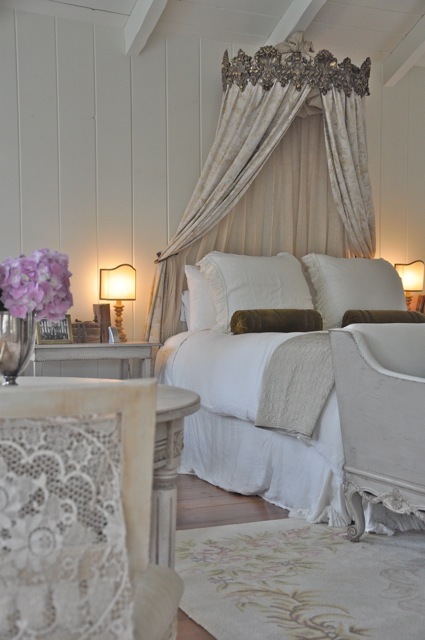 This bedroom looks so fresh and inviting---maybe it's a guest room? 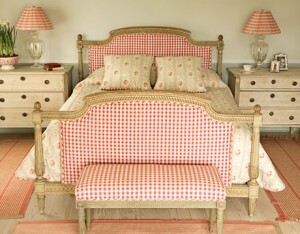 I like the French head and foot board and I think upholstered headboards would be comfortable. Would it be a dirt magnet? I've seen suitcases stacked to create a nightstand before, just never using Louis Vuitton cases. 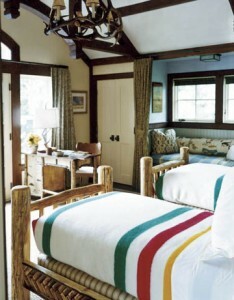 This streamlined look is relaxing to me; I like the windows above the bed. 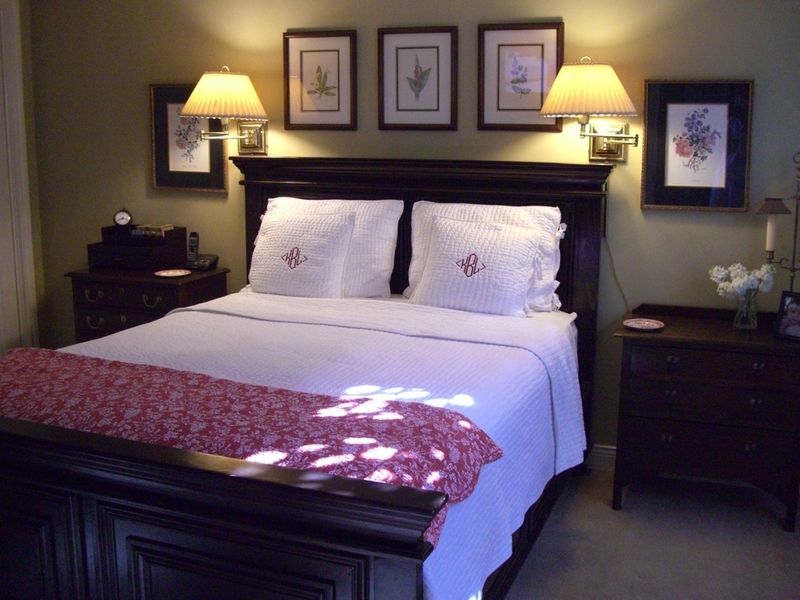 Another padded headboard---the lamps are great with the prints and neutral duvet. Can you guess? This is a Ralph Lauren room---it reminds me of a sharp men's suit---in fact I think one of the fabrics is called "suit ticking"
Red and white toile, need I say more?! In case you weren't aware---I'm going to be a Grandma very soon!